At a lanky 6’4”, Taylor is as hard to miss as he is pleasant to behold. The 25-year-old Eugene, OR native is a picture of millennial youth and young manhood with smaller-than-LA-town charm getting his career bearings after having officially made the move to LA in 2016. Tonight was night #2 of his month-long April residency at one of LA’s most venerable venues: Hotel Café. It’s a place that is notorious for hosting high quality and often legendary artists of all genres, but specializes in showcasing music of a more intimate and personal nature like the bar stool sitting, guitar wielding singer/songwriter. Taylor’s gig fits that mold, but is additionally touched with a richly warm-blooded, personal and soulful folk approach to the art of musical storytelling. His lyrical game is strong: See his second EP, Hiraeth, for further. 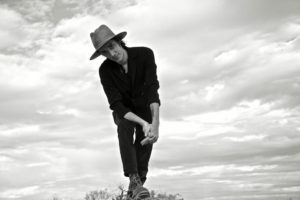 So beneath the harsh lights and a couple of hours before his set at Hotel Café, Taylor feels like an open conversationalist: there is a fine line between self-conscious and self-aware and he seems to lean more towards the latter. 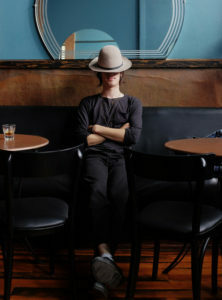 Basketball, camping and video games are simple things that he enjoys along with an alcoholic beverage, namely whiskey. While he’s settling into LA life, he still misses Oregon enough to make the trip home every few months. Bro-country is a scourge on humanity and people call him “John Taylor” instead of “Taylor John” all the time and he thinks it’s bizarre. I defended/explained my particular urge to transpose the names due to the fact that I grew up with Duran Duran bassist, John Taylor, in my brain so, perhaps, the error seems somewhat more…excusable. And rock n roll. Perhaps. The Hiraeth EP: What’s In A Name? “It’s a word that means…it’s a longing for. It’s basically like a homesickness. Feeling homesick for something that you can’t necessarily return to. So it’s like a lost place. Be that a physical place or a metaphysical place or whatever you want to call it. “I love playing with other people. It’s just such a different…there’s so much more room to stretch. When it’s just you up there it’s harder to improvise and it’s harder to take risks ’cause there’s nothing to carry a flub. It’s very obvious. So I find myself now with the band, kind of, taking more risks and exploring my own potential as a front man. Supporting him was a solid cast of characters also known as “the band”: Zachary Ross (guitar), Eliot Lorango (bass), Thomas Greene (drums) and fellow The Voice alumni Ricky Manning as guest vocalist and as this was merely night #2 of his residency, we were watching a group of musicians work out their kinks and that wasn’t a bad thing especially since there were no musical catastrophes. We were treated to songs like “The Hills Of Holmby,” “Like The Movies,” “White Summer Dress,” “Quite Like You,” “Green Eyed Beast” and putting Greene through his drummer paces in order to cover the skittish beat of Paul Simon’s “50 Ways To Leave Your Lover.” There was that one moment near the end of a song when they all hit a magical stretch of groove only to have it comically interrupted by the neck of Ross’ guitar accidentally scraping his mic stand. Yet that simply made the show all the more precious as 80% of the audience (and 100% of the band) dissolved into laughter. So, yes, it was all a revelation: the conversation, the performance, the man. From harsh lighting on the boulevard to a session of musical show-and-tell (as many things discussed earlier in the eve seemed to be threads of thought in his songs), this was getting in on the ground floor of witnessing John Tay…ughh, Taylor John Williams on his personal road of discovery, watching “a new band figure themselves out on stage” and an artist in the act of “becoming.” Becoming something more than a guy from Oregon, more than a Los Angeles dreamer and certainly more than a former contestant on a reality show.